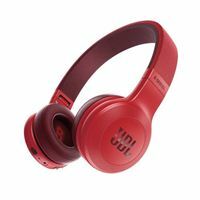 Enjoy big sound without cables with the JBL E45BT Bluetooth On-Ear Headphones in red. These headphones connect to your mobile device using Bluetooth 4.0 and sport 40mm drivers, which deliver a frequency response from 20 Hz to 20 kHz with 32 Ohms of impedance. Music controls and a microphone are located on one earcup for convenient control over your calls and music, and the included fabric-covered cable with angled plug has a remote and mic of its own. The E45BT can seamlessly switch between connected devices and last for up to 16 hours on a full charge of the battery, which takes approximately two hours to replenish.